Emily's Recipes and Reviews | UK Food Blog | Leicestershire : king prawn, spinach and basil pesto gnocchi bake. king prawn, spinach and basil pesto gnocchi bake. The perfect midweek meal for seafood lovers. Taking moments to assemble, pop in the oven for a wholesome bake which goes towards one of your five a day. 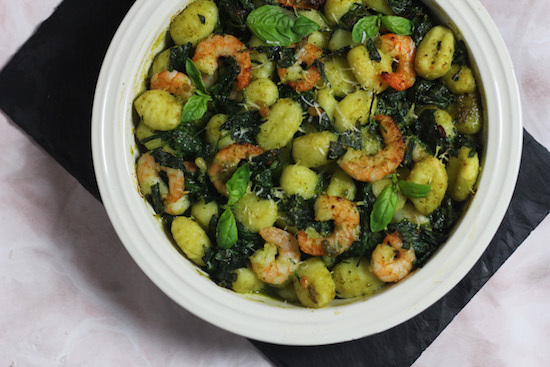 Featuring fresh basil pesto from Giovanni Rana, the recipe simply stirs together cooked king prawns, gnocchi and wilted spinach before being scattered with Parmesan and cooked until golden. Step one. Cook the gnocchi in boiling water according to packet instructions, which usually takes around three minutes. Drain. Meanwhile, wilt your spinach in a little water on a low heat. Step two. Stir together the gnocchi, king prawns, spinach and pesto. Scatter with grated cheese and baked for around 20-25 minutes until golden. Step three. Serve with extra basil leaves and dig in! Have you ever tried the Giovanni Rana sauces? What are your favourite pesto recipes? merry christmas from recipes and reviews! k west festive afternoon tea, london.